This lovely wine bottle was a birthday present to me. The bottle is made from the typical grey pottery, as much seen in the Han dynasty ( 206 b.C.-220 a.D) It is 17 cm in height, and 13 cm across. 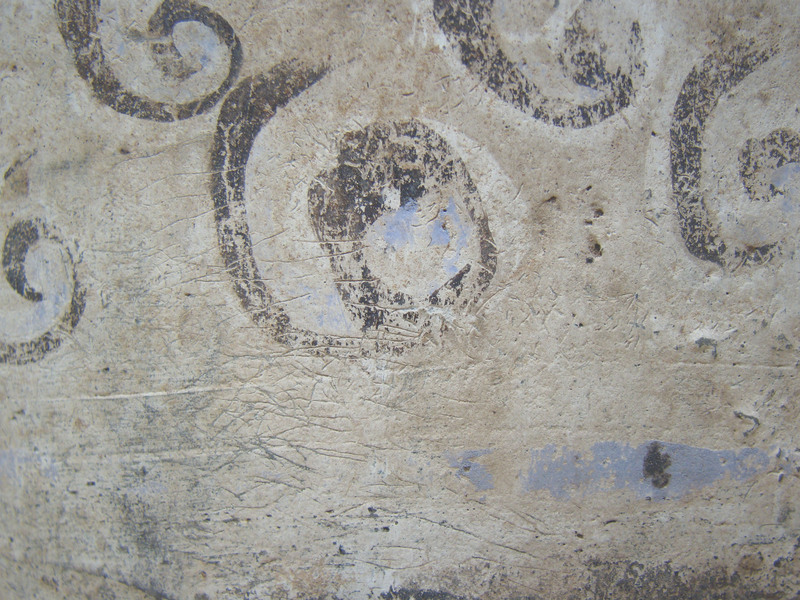 It is covered in a white slip, and there are good remains of the original decoration. This bottle was never intended for use, but a burial ware. The bottom fired black in the kiln. The colours of the decoration are Han dynasty colours; dark brown, orange, and purple. The decoration is not an enamel but ‘cold painted’, although these were sometimes fired in the kiln. The surface shows wear according to a long burial, and dark spots from fungous. These are often imitated using black paint, splashed over a replica. There is a difference when carefully examined. Winebottles are relatively rare in Han pottery. ← cup Warring States / Spring and Autumn period.